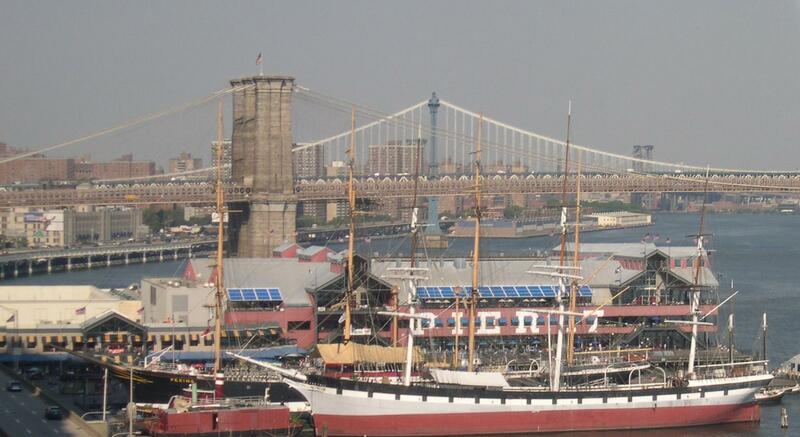 Since 1983, the South Street Seaport has been one of the country’s most famous “festival marketplace” style shopping malls. Built as part of a craze to introduce suburban style shopping hubs in the center of cities, festival marketplaces were designed to try and stop the loss of shoppers to the suburbs and revitalize struggling cities by building a retail critical mass within cities. Unlike most malls, they tended to be designed specifically with tourists and suburbanites in mind, presenting a somewhat sanitized, self-contained version of city life designed to allay fears of crime and blight that were associated with major cities in the ’70s and ’80s. Major cities like New York and Boston (whose Faneuil Hall Marketplace probably stands as the country’s most successful development of this kind) didn’t experience this loss of shoppers and tourists as acutely as many mid-sized cities, but developments like South Street helped keep the shoppers coming, and carried parts of America’s big cities through their most troubled days a few decades back. By and large, the Festival Marketplace craze wasn’t terribly successful, but South Street Seaport stood as one of its most prominent success stories into the 2000s. Unfortunately, it seems as though South Street–which is still a bustling center today–may have outlived its usefulness. Retail Traffic Court alerted us to this story, which announces that General Growth Properties, the management company in charge of the center, plans to raze the center in favor of a tall building and ferry landing, leaving the remainder of the pier as open space. I believe the inland (and older) portions of the development are designated as historic, so they’re likely not going anywhere. The 24-year-old shopping mall, however, may soon be history. Other than putting lots of hard-working people out of work, I’m not sorry to see this place get bulldozed. It does a wonderful job of blocking the view of the Brookyn Bridge, it fails miserably to serve the neighborhood around it, and it acts as a giant tourist magnet where they can chomp overpriced pretzles and sodas, while watching manufactured acts such as jugglers and magicians. This might be great in Peoria or Petaluma, but, IMHO, New York has such a wealth of authentic, historic, and meaningul sights to see, it pains me to see tourists waiting their time down there when there is so much more to see. When we used to do school trips to New Yorrk, invariably we’d end up at South Street Seaport. I never cared for the place, but it’d be sad to lose it for yet another mixed-use complex. I agree, New York’s tourist offerings are far too many and varied for a festival marketplace to find a proper niche. It’s almost too tacky for New York, but it would belong somewhere like Las Vegas or something and be considered appropriate. On the other hand, the festival marketplace has done better in places where it functions as a catalyst to reinvent a downtown space or promote tourism where little previously existed, such as downtown Santa Monica, Baltimore Harbor or Navy Pier, which is Illinois’ #1 tourist destination. The one in Boston, Faneuil Hall, has even seen better days as a retail destination with the closing of many chain stores geared at tourists. Today, it functions more successfully as a food hall/food court and with stores selling souvenirs rather than what they could find in their home malls. It’s also somewhat interesting to note the term “festival marketplace” is corporate branding, as it was invented chiefly by the Rouse Company for their downtown revitalization efforts in the 70s and 80s (such as in Baltimore). As a result, these seemingly public places with outdoor streetscapes and the like have private elements and code of conduct rules, and can prohibit who comes in and who goes out. For example, in Baltimore, bums are removed from the Inner Harbor and also street performances are prohibited without prior management approval. This confuses the boundaries of first amendment rights for many, who are unaware they are actually on privately held property. That’s soooo not the case. I work directly across the street from the Inner Harbor and can testify firsthand that there is an overabundance of panhandlers. I don’t know if it’s that the cops and security don’t do much about them, if there are just too many of them, or both, but they’re there. They run the typical gamut from alcoholics to junkies to the mentally ill, and they are frequently seen sleeping on benches (especially in front of California Pizza Kitchen and the Cheesecake Factory), especially in the middle of the afternoon when the soup kitchen on Gay Street is closed. The really brazen ones will come into Harborplace and hassle people for change or cigarettes…not terribly often, but often enough. As for South Street, I grew up in NJ and went there many times, but am not surprised to see it go. It served far more of a purpose back when Times Square was the land of peepshows, prostitutes, and no-tell motels; after Midtown was cleaned up a lot, and especially after 9/11, it became more off the beaten path. You’re spot on about the bums in Baltimore. According to my father (so take it with a grain of salt), there’s some ordinance that recognizes panhandling as a legit occupation in the city limits, so there’s nothing anyone can do unless they get REALLY aggressive. The worst are at the Inner Harbor, since they’re a hair away from that (we had one yelling death threats at everyone who didn’t give him money – including my family). It got to the point where, after ruining a vacation down there when I was a kid, my father – a proud native of Baltimore – said he was done with his hometown. He hasn’t been back since. So yeah, you could say Baltimore has a problem with bums, but they’re entirely at fault for it. So what was the place like? Is it open-air? Sorry, that’s what I meant. would block the view more than the present complex. Don’t mean that as nasty, please don’t take it that way, but I woould, after living in NYC for 34 years assume that one of the catch phrases for the new complex would be fantastic views of the New York City skyline and Brooklyn Bride. The “open” space sounds suspect. The NY examiner mentions South Street Seaport is basically a tourist trap: the food court has closed, and the mom-and-pop chains have been driven out by overpriced chains. Sounds hard to disagree with. NYC needs less retail saturation anyway. As one of the persons who saw the South Sea Seaport market go up and who still oves the place, I am very distressed to see it go. But I guess blocking the view with boats and people out in the sun, enjoying themselves is far less useful than blocking the view with buildings! I will miss you South Street Seaport. It’s already closed, shame I couldn’t see the inside.